KINSHASA (Reuters) - President Felix Tshisekedi's Congo government on Monday blocked newly-elected senators from taking office after a disputed vote that gave allies of his predecessor an overwhelming majority in the upper house of parliament. 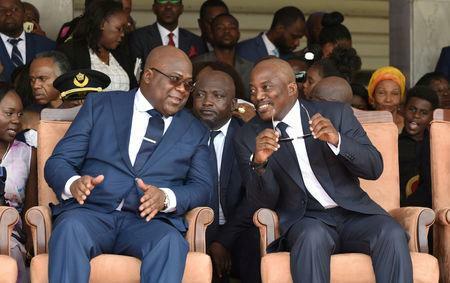 The decision, announced after a meeting between Tshisekedi, cabinet ministers, the electoral commission chief and others, could trigger a standoff with ex-president Joseph Kabila's camp two months after Tshisekedi succeeded him in Democratic Republic of Congo's first ever transfer of power via the ballot box. Kabila's FCC coalition won 80 out of 100 seats, which are voted on by provincial assembly members, in Friday's election, compared to just three for Tshisekedi's UDPS party and its allies. At least one person was killed in the protests and some offices of Kabila's political party were ransacked. Speaking to reporters after Monday's meeting, Basile Olongo, the interim interior minister, said participants had decided to suspend the installation of new senators pending investigations by prosecutors into corruption allegations. Kabila's camp immediately criticized the decision. "The constitution does not authorize an inter-institutional meeting to make these decisions," Jean-Pierre Kambila, who served as Kabila's deputy chief of staff, told Reuters. He did not say if the FCC planned to challenge the decision in court. Opposition leader Tshisekedi's victory in the Dec. 30 presidential election was also marred by allegations of graft. Supporters of the runner-up, Martin Fayulu, accused Tshisekedi of striking a deal with Kabila to rig the outcome when it became clear Kabila's preferred candidate, Emmanuel Ramazani Shadary, could not win. Kabila was barred by term limits from standing again after 18 years in office. Tshisekedi and Kabila's camps deny the election was rigged. 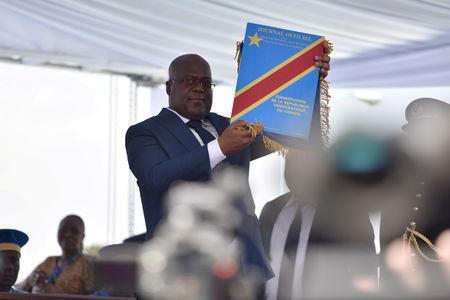 But some Tshisekedi supporters have voiced concern about his ability to govern independently, given the FCC's parliamentary majorities and Kabila's grip on the security services.